The pressure to deliver that prized gift on your child’s Christmas wish list can be unlike any other. But experts say instead of ruining Christmas, you might actually give your little one the best gift of all by failing to deliver. This year Hatchimals, an interactive bird that hatches from an egg, and the Nintendo Classic Mini: Nintendo Entertainment System, an homage to the original Ninentendo and games, seem to be on top of most lists this year, yet supply is low. In fact, unless you were one of THOSE parents who cleverly queued outside stores on release day weeks ago, chances are that you’re plain out of luck in getting your hands on either. As frantic parents call every store in the book, scour the web and turn to social network groups pleading for help to make their child’s Christmas dream come true, there comes a point where you have to step back and reevaluate. Sure, we all know there’s a worldwide currency more valuable than any other and that is the look of pure joy from your own child as they open the gift on Christmas morning that their little heart has been hoping for. But before you desperately click ‘buy now’ online and hand your cash over to an opportunistic buyer who stocked up early on the latest toys to resell at overinflated prices to parents like you who are desperate to deliver, stop and think. 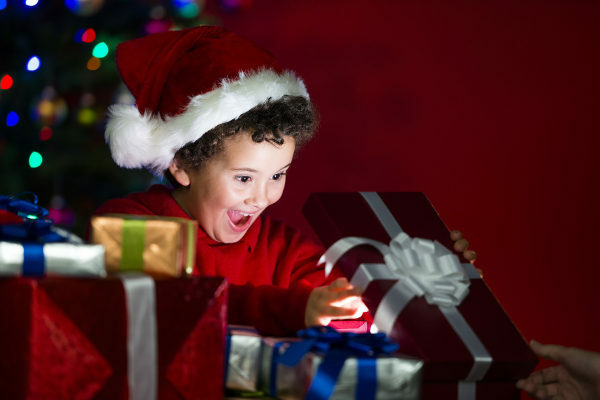 Children bring their own magic to Christmas and if we teach them qualities such as gratitude and mindfulness, it has to trump any plastic device they could possibly hope to unwrap. Melbourne clinical psychologist Sally-Anne McCormack says that sometimes the best thing is for parents not to give their child everything they want. Now many of us know this to be true, but figure Christmas is the one time to make an exception.However, Sally-Anne says children are likely to experience more joy when they learn to be grateful. Sally-Anne says parents may think they are failing the child if they are unable to deliver what they want at Christmas. Saylly-Anne says parents shouldn’t feel bad if they can’t get their children what they want. “They should feel proud they are teaching them a valuable lesson in life,” she says. Changing the focus from what a child didn’t get to what they have, is one way Sally-Anne says parents can emphasise what is most important. “Ask your child to tell you three things they are grateful for today on Christmas Day,” she says. If cost is what is standing in the way of parents getting their child a particular gift, Sally-Anne says it could be a great opportunity for goal-setting together. It is us as parents who create the day’s meaning for our children so, if we make it all about gifts, that’s likely to be what they will focus on. This year perhaps we can afford the shark goggles our two-year-old can’t stop talking about, but in six years time who knows if we can afford the latest gaming console or mountain bike on the market. Personally, I was kicking myself about an hour after my then two-year-old son opened his ‘must-have’ gift last Christmas. He wanted a walkie talkie but silly me left it to the last minute and, by the time I hit the shops, the shelves were empty. Os instead of spending $20 on the ones he had seen, I spent $80 on a set aimed at much older children to avoid his disappointment on Christmas morning. After an hour of switching them on and off, he was over it and spent the day fixated on a rubber ball he got from a bon bon.